When it comes to glass Christmas ornaments designed to hang on a holiday tree, the greatest value usually lies in figurals. These are clever ornaments shaped like people or things, as opposed to plain old glass balls. One aspect to keep in mind with these ornaments, like most collectibles, is condition. Those with little to no paint loss, all original components, and glass in all the right places will always bring higher values than less stellar examples. Ornaments were used year after year on holiday trees around the turn of the 20th century on into the 1920s, so they rarely come to market in pristine condition now. When they do, they're worth a good bit of cash to collectors. Some of these beauties have been reproduced as well. It’s always wise to question authenticity if the condition of an ornament you’re considering for a collection is too good to be true. Again, most will have some sort of wear, even if they are in excellent shape for their age. It’s also a good idea if you’re bargain-minded to shop for ornaments like these in the off season. Just as with modern Christmas decorations, the best deals on vintage ornaments can be found when they're not in peak demand for holiday decorating. The king of the figural Christmas ornament is the “kugel,” a term that actually means ball in German. These were first made in Germany by glass crafters during the Biedermeier period around 1830, according to an Antique Trader article by Karen Knapstein. Those old versions were too heavy to hang on Christmas trees so they were suspended from the ceiling and actually displayed all year round. After 1855, thinner versions were made and those could be used as holiday ornaments on the family tree. Collectors usually refer to any thick blown glass ornament with a fixed decorative cap as a kugel. It’s said that these were first sold in America at Woolworth’s variety stores in the 1880s. Figural examples shaped like clusters of grapes in rare colors like red or amber can be worth in excess of $1,000 apiece. Egg-shaped kugels might sell from $500-800 each and round balls can be found for much less in common colors. Take care when purchasing these, however, because some examples have been reproduced. Many of the other popular figurals collectors seek are shaped like famed personalities or characters of yesteryear. For example, an Eddy Cantor (a comical singer and actor popular during the first half of the 20th century) ornament with chenille arms might be worth $500 or more to the right person. One shaped like John Bull (the personification of Great Britain that originated in cartoon form) could approach $300 in the right market. An example designed to resemble President William Howard Taft’s head, also sometimes described as an "Einstein Face" ornament due to its resemblance to the scientist, can be found for $100-150. Animals also bring in good sums. A rare Puss ‘n Boots glass ornament with chenille limbs could go for $800-1,000. A clip-on cat head ornament might fetch $300-400, while a kitten in a stocking ornament with a bright color scheme could sell for $200-300. Other figurals shaped like birds, Indian chiefs, and airplanes with metal wheels can sell for $100-250 each, along with a host of other interesting shapes. If you’re looking to outfit a vintage style tree without spending a small fortune, there are some alternatives. Glass ball ornaments that don’t date back nearly as far as kugels will be the least expensive, and the easiest to find. 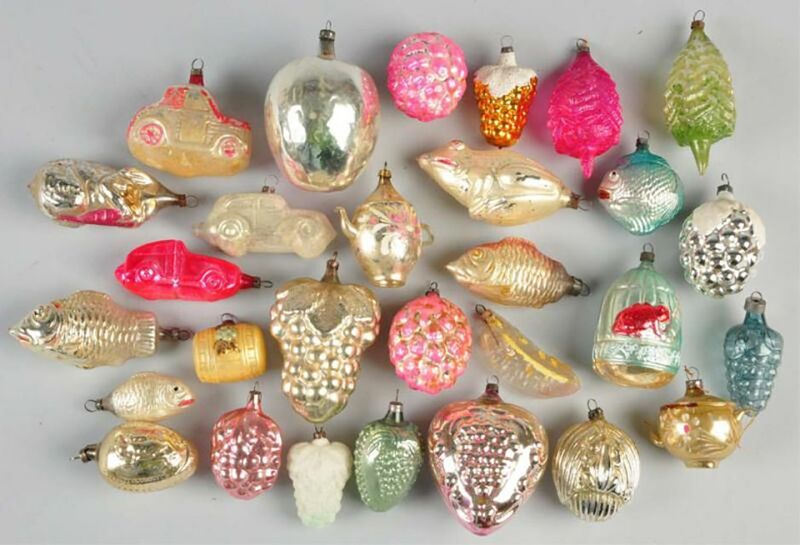 For instance, an entire box of stenciled Shiny Brite ornaments dating to the 1940s through the ‘60s in excellent condition might sell for $50-60. If you shop around to find them one at a time, you’ll likely pay in the $5-10 range, or a bit more for rare or extra special examples. Even older kugel spheres don’t usually go as high as figurals, although they do share the same type of fixed decorative cap surrounding the hanger. These true antiques usually sell for $30-100 depending on the color and condition. This lot of 30 vintage glass ornaments sold at Morphy Auctions for $270 (not including buyer’s premium) in September of 2011. Most are figurals in the form of grapes, cars, fish, and frogs with one unusual frog climbing a ladder example. At $9 each, the net auction price per piece, these can be considered a very good buy. Sold individually in an antique shop or at an antique show, they would likely bring $20-50 each or possibly more for the rarer examples in the lot. Some collectors will pay for an entire lot like this one to obtain a rare ornament. They then sell or trade the remainder of the lot to garner examples they covet.